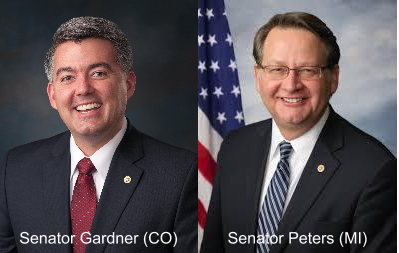 On 23 June 2016, Senators Gardner and Peters introduced the American Innovation and Competitiveness Act (S. 3084), which was then referred to the Senate Committee on Commerce, Science, and Technology. Senator Gardner, Senator Peters, Chairman Thune, and Ranking Member Nelson lauded S. 3084 as a "...bipartisan bill that maximizes basic research by reducing administrative burdens for researchers, enhancing agency oversight, improving research dissemination, and reforming federal science agencies to increase the impact of taxpayer-funded research" in their press release about the bill's introduction. In summer 2015, the Senate Commerce committee created a working group to draft this legislation. The working group met with stakeholders from the research community to gather what Senators Thune and Gardner described in an op-ed they co-authored last year as "...consensus ideas...about how to enhance our research and development (R&D) enterprise, and improve science and technology policies...." In the year since, the working group has held town halls and roundtables with and solicited email input from academia, government agencies, and industry to discuss how to keep the US competitive, to maximize federal investment in R&D, and to reduce administrative burden. To learn more about the legislative path that led to the introduction of S. 3084 refer to AIP FYI's coverage on the subject in their posts from July 2015, October 2015, May 2016, and June 2016. S. 3084 includes policies for the Office of Science and Technology Policy (OSTP), the National Science Foundation (NSF), and the National Institute of Standards and Technology (NIST). It also includes policies for R&D and STEM education in general. Reaffirms NSF's merit-based peer review of intellectual merit and broader impacts criteria as the best way to fund research that is "scientifically and societally relevant." Codifies the NSF-led improvements to transparency, which includes publicly releasing easily understood summaries of projects that have been funded. Updates EPSCoR programs to maximize the impact of such programs. Directs cybersecurity research and updates for networking and IT R&D. Instructs a subcommittee of the National Science and Technology Council to provide recommendations on high energy physics research and facilities construction priorities. Requires NSF to evaluate the potential for mid-scale projects across the disciplines. Implements changes to MREFC oversight, including establishing appropriate project management, ensuring that managing costs are consistent with Government Accountability Office guidelines, and including full life-cycle costs in the pre-award analysis. Establishes an interagency working group to reduce administrative burdens while protecting transparency and accountability, which will include a review of the grant proposal process and of the mandated progress reports. Instructs OMB and OSTP to revise policies related to researchers attending conferences. Establishes an interagency STEM Education Advisory Panel, which will work with the Committee on STEM Education (CoSTEM), to evaluate the effectiveness of existing federally-funded STEM programs and to consider ways to improve the STEM workforce pipeline. OSTP to establish an interagency working group compile research and best practices on how to "...promote diversity and inclusions in STEM fields and examine whether barriers exist to promoting diversity and inclusion...,"
NSF to expand grants for computer science education research. Expands opportunities for crowdsourcing research and citizen science participation. Updates and expands programs related to public-private partnerships and manufacturing, e.g., NSF's Innovation Corps. Notably, the legislation does not include any authorized funding levels for the agencies. The next steps include consideration of S. 3084 at an executive session of the Senate Committee on Commerce, Science, and Transportation on 29 June 2016; we expect that an amendment will be included that contains the authorized funding levels. Assuming it is passed by the committee, S. 3084 will then head to the full Senate floor for consideration. Recall that the House version of the COMPETES reauthorization passed the House in May 2015. For updates, please refer to Information about Relevant Policies: COMPETES.